It’s one more day of double the Leo Lady, as the main lead singer of The Toys, Barbara Harris, celebrates her 70th Birthday this August 18th. 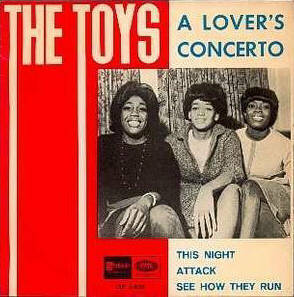 Their “A Lover’s Concerto” caught the ears of the pop buying world by storm (and The Supremes off guard, totally recognizing their 4/4 Schtick of song being co-opted for the biggest Supremes-a-like hit ever recorded) 50 years ago this late Summer. But just like that, it was over for the group in terms of high flying chart entries. The fighting between producers and their managers came almost immediately. While the producers thought it was key to keep them in the studio recording new content, their manager wanted to exploit every publicity opportunity possible. In the middle of the storm, The Toys watched opportunities on both fronts wither away, that by the end of 1966, they were out of a label and producers, and looking for their next pasture to graze. It seemed that Philips Records seemed the perfect large label to sign up for. However, as true with many R&B acts, it was really hard to find an advocate in the larger halls of Philips records. Though both of their singles were worthy frothy numbers, with “My Love Sonata” in particular harkening back to their hit sound from 2 years previous, they couldn’t conjure up the chart spell that they did in previous years. Another label hop to Musicor would happen in 1968 before they called it quits. All in that time, they remained a group that consistently recorded top flight material through and through. Here’s to the legacy of Barbara Harris and her group mates shining brightly for many more years to come.